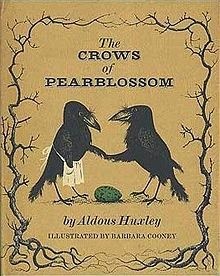 The other day I read 'The Crows of Pearblossom', a children's book by Aldous Huxley [minor spoiler alert]. I was curious to read it because of the author, whose dystopian novel 'Brave New World' I really liked. Apparently Huxley wrote this story for his niece, who was 5 or so at the time. Its a pretty nice story with many delightful instances of the protagonists having human characteristics (anthropomorphism). However, it was also a sadly typical tale where a carnivore (a snake in this case) is shown as evil. That got me thinking, how important it is to sympathetically portray carnivores in children's books/movies. We are all intuitively driven to like 'cute', harmless creatures like rabbits or cows, and its also easy to show them as nice characters / heroes in our stories. Carnivores by dint of their diet, often end up playing the role of villains. They loom over the heroes of the tale, promising death or danger. Their personality then is also logically shown as dark or even outright evil. Isn't it ironic, given we ourselves as humans are biologically omnivores (I know many of my friends could possibly be categorized as pure carnivores given their dietary choices!). The point is, though its easy as a narrator to show carnivores as the villains, are we not obliged to show them in a neutral / positive manner? Are we not creating an unhealthy fear / dislike for carnivores in our children by painting them black in otherwise shiny white tales? Think about it: children should be taught to be careful around carnivores like snakes, but why should they all consistently dislike snakes but adore say, sparrows? Humanity has struggled with letting carnivores be in peace for a long time. Its almost as if we psychologically like to destroy other predators (especially apex predators like the big cats, wolves, or large birds of prey like eagles). Part of it is safety, but a lot of it is also just some primeval form of one-manship. Just look at all those photos of kings triumphantly posing with dead tigers. Given our own issues, isn't it time we stopped loading our children with emotional baggage about the supposed wickedness of carnivores? Disclaimer: I am not saying we deliberately mis-portray carnivores in children's tales, just that we often take the easy route out when sketching animal characters, which ends up priming our kids poorly. Huxley himself idly made up this story for his niece one afternoon, which is quite fine for a one-off. Dreamworks' Madagascar is a good example where the storytellers explicitly played with the dynamic tension of having a mixed set of carnivores and herbivores in the lead cast (scene where Alex the lion starts to crave his friend Marty the zebra as a juicy steak). I obtained almost no time regarding half truths, except if it really is bully grab components. I love these louis vuitton replica. Nonetheless together with almost all value, I recently hate any time many of these organizations are attempting to trick myself directly into acquiring one thing. The particular greater they will handle myself and also My partner and i rely on these, the higher possibility I am going to get back to help make yet another buy. fake gucci belts not necessarily an individual consent? My partner and i for instance a enterprise which can be directly with me at night once i feel searching for pickup truck components or perhaps whatever else for example. There are tons regarding custom made pick up components you may get with genuine outstanding costs on the web. They've got sets from gucci replica bags pickup truck components to be effective vehicle components and also pretty much everything among. It is possible to modify significant amounts of the original products on your own vehicle together with selection of aftermarket vehicle components. I do believe you need to make an effort to select the fake prada with out acquiring also tacky. You want to try to retain that superior to produce a authentic effect. You might be just what an individual push you recognize. There is certainly above blinking that. You can several authentic excellent components you need to include several items that are expected, for instance a tonneau protect, fantastic off-road flaps. Things such as custom made billet propane gas grills usually are not necessary nevertheless they can add a hermes replica hat regarding school and also help make the vehicle slightly unique of the man who's the identical type when you across the street coming from your geographical area.